We're now offering Ellel teaching as downloadable MP3s. MP3 is the mainstream format of digital audio and can be played on all modern computers and CD players. To receive your teaching purchase instantly simply complete the checkout process as normal. 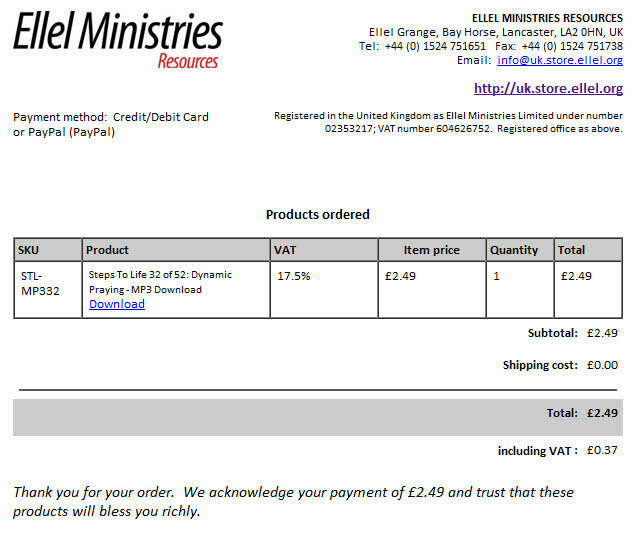 Once your payment has been confirmed you will receive a receipt for your order with a download link for each MP3 teaching you purchased (see the example below)). You then have 48 hours in which to download your products. If you have any trouble downloading the file just contact us to have your download time extended. 'Steps to Life' is a dynamic, 52 part teaching series with Peter Horrobin, Founder and International Director of Ellel Ministries. The lives of many listeners have been impacted by these half hour radio programmes now available to buy. The Truth and Freedom Series presents anointed Ellel teaching from past conferences and other Ellel events that have been reformatted into a series of key topics for the Body of Christ today.